Andreas Tophøj and Rune Barslund, two leading folk musicians of their generation,perform with violin, accordion and viola. 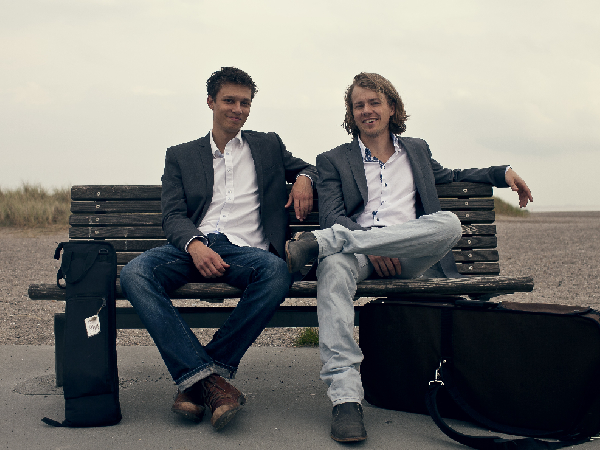 The accomplished duo has its roots in Jutland, Denmark, and emerged from the folk scene formed around the Academy of Music in Odense, which until recently was named after composer and musician Carl Nielsen. Like the famous composer, the sound of the duo is closely linked to the Danish folk tradition, but the two young musicians also offer a new interpretation of Danish folk influenced by music from various countries and traditions. The duo draws on a wide range of inspiration gained from residing in Ireland and the US and from encounters with Celtic and Nordic musicians and musical cultures. Accordingly, the repertoire of the duo is based on a compelling musical melting pot and mainly features original compositions. The two musicians are also known from other bandssuch as ZAR, Kasír and Basco. Andreas and Rune are both very experienced musicians mastering a high musical and technical level as well as captivating ensemble playing. In April 2014 the duo recorded its first release on the isle of Funen, which has recently become the center of Danish folk. The result is the EP The Danish Immigrant, which was released in July and includes the track for the music video of the same name, which was awarded track of the year at the Danish Music Awards Folk in 2012.